Our Client Relationship Manager recently met with Eunice Ngetha in Embakasi, Kenya. 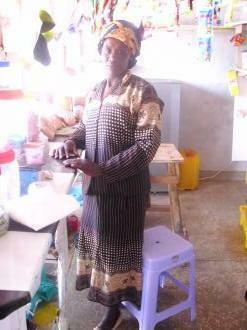 Eunice runs a detergent business where she sells her products to the public and institutions. They are dangerous chemicals but Eunice is experienced. With three children of her own, and an additional 5 she and her husband adopted, you could say she has a full house! My name is Achintya Rai and I am Zidisha’s current Kenya Client Relationship Intern. On 7th March I met Eunice Ngetha in Embakasi area of Utawala in Nairobi. Eunice was part of a Self Help Group that taught its members to make detergents and disinfectants. Eunice later started her own business of making these and selling at prices lower than the market. The detergents and disinfectants Eunice makes are used by hospitals and schools to wash floors, clothes, utensils and lavatories. The chemicals Eunice uses are dangerous to store so she buys them only after she has received an order. And she receives many of them. She said to me “Even if I go to America I’ll find an order!” I have no doubt she will because Eunice is one of the most confident persons I have met here. Eunice told me about an incident which confirmed to me that she is a great marketer. To transport drums of detergents to faraway places, she loads them in public buses and the customer unloads them at his location. She once lost 25,000 Kenyan Shillings worth of detergents when the customer told her he never received it. But she never complained. And now she has very good relations with this customer. Eunice found Zidisha on her own. Her earlier loans were very costly so when she needed capital for her business she ‘googled’ it and found Zidisha. When I met her she had not yet received the disbursement of her loan but she planned to use it to buy chemicals for this big airport contract she had recently got. Her husband is the principal of a school in Machakos where Eunice also used to work as a matron. She left that job and shifted to Nairobi when the business picked up. Eunice has three children, two of whom are studying. She has also adopted five children. Three of these are orphans in her village and the other two are bright students from a school she went to sell her products to. The principal told her that these students couldn’t afford their school fee and Eunice readily decided to sponsor them. This is one trait I have found common in many Kenyans, this incredible desire to share their wealth. Eunice’s dream is to build a school. She told me that she has already bought 3 acres of land in an area called Embu for this. I expect great things from Eunice. With her energy and her desire to help others, I wish she succeeds in whatever endeavors she undertakes. Meet Grace Wanjiru, one of our borrowers from Nairobi, Kenya. Grace is a mother of three children, and one grandchild. After the death of her husband, Grace was forced to leave her home by her in-laws. Because Grace still needed to pay for her youngest son’s education, she decided to start her own business! Grace ran a shop where she sold various household items and foodstuffs. Grace applied to Zidisha so she could purchase more items to sell in her shop, and increase her profit. However, because of high rent and low profit margins, Grace sold her business and started a new endeavor! Grace with Joyce and her cart. My name is Achintya Rai and I am Zidisha’a current Kenya Client Relationship Intern. On 10th March I paid a visit to Grace Wanjiru in Utawala area of Nairobi. 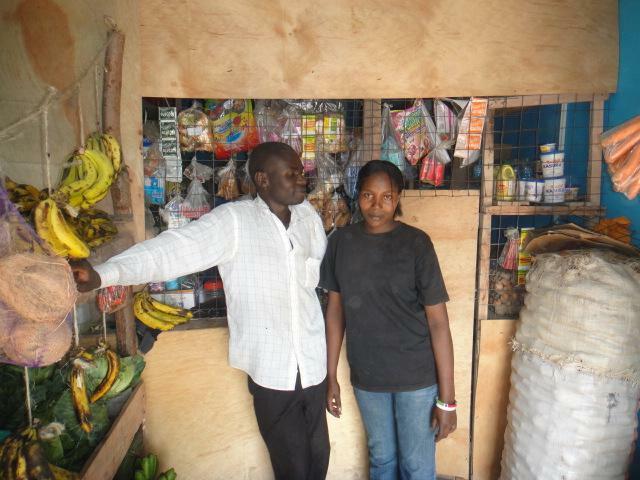 Grace took the loan from Zidisha to increase the stock of her shop. But the rent she was paying for her shop was quite high and the returns were not enough. So she sold that business and used the money to buy a donkey and a cart. She uses this to transport water to construction sites. The day I visited Grace it was quite hot. She told me she transports about 20 drums of water in each trip and she is able to make 7 to 8 trips in a day. This is hard labor, especially in that temperature. But Grace seemed happy with her new business and was quite thankful to Zidisha. Grace has three children, two of whom have finished their education. Her youngest son stays with his maternal grandmother in Naivasha where he is studying (Grace pays the school fee). He recently cleared the form-1 exams well and Grace was very hopeful about his future. On my way to meet Grace, I saw a man at a bore-well (place where donkey cart owners like Grace buy water from) beating his donkey. My first impulse was to shout at him, but I resisted, being in a foreign land. He stopped when he saw me looking but it was an upsetting site. To be fair though this is very rare in Kenya. In fact this was the first time I saw someone mistreating an animal. I was very pleasantly surprised when I found that Grace was extremely nice and kind to her donkey Joyce. She patted Joyce affectionately many times and unconsciously caressed her neck while talking to me. Joyce contently closed her eyes. When I asked Grace she told me that’s how Joyce caught on her sleep between breaks. With her next loan Grace wants to buy a knitting machine to knit pullovers. These are in high demand as part of school uniforms and with many new schools coming up in the area, Grace sees this as a good opportunity. As a last note I must inform the lenders that Joyce is pregnant and will be expecting a baby donkey in Jan next year. I hope Grace posts pictures. 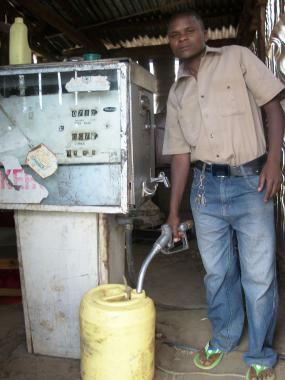 Mr. Wambugu with his gasoline pump. Benedict Wambugu is a Zidisha borrower from Kiptangwanyi, Kenya. He runs a business where he sells kerosene, diesel, and now gasoline (thanks to his Zidisha loan!). Mr. Wambugu has a great location for his business because many of his customers do not have electricity, so they require fuel for cooking and lighting. My name is Achintya Rai. I visited Kiptangwanyi on Thursday (2nd Feb 2012) and had the chance to meet Benedict Wambugu at his business premises. Benedict has a small store from where he sells Petrol, Kerosene and Diesel to people here. Before taking his Zidisha loan, he used to sell only Diesel and Kerosene, but with the loan money he started selling Petrol as well. He buys petrol for 112 shillings a liter and sells it for 130 shillings. He sells about 10 liters of petrol in a day. Most of his sale is of kerosene, which people use for lighting lamps. He has a mechanical, hand operated pump that he uses to fill kerosene. This pump is connected to an underground tank, which the company truck comes and fills up. Benedict seemed very proud of his pump and volunteered to demonstrate to the camera how it operated. Even though I told him not to because I was taking still pictures, he insisted. I hope some of his energy spilled over in the images. With the next loan, Benedict wants to buy a motorbike. He now uses a bicycle and this limits his reach greatly. Benedict is 23. He is married. Astou Diop is a borrower from Dakar, Senegal. While studying, Madame Diop learned how to sew. A few years later she started her very own sewing and tailoring business! This young mother uses her business to support her family. Madame Diop wants to use her Zidisha loan to open a traditional boutique to sell her goods and increase her profits. Yesterday, I met with Madame Astou Diop who lives in the Cambarene neighborhood close to the beach. She is married and has one daughter. She lives with her father, mother, three brothers and one sister. She and her brothers are the main providers for the family. One brother lives in Spain, one is a doctor and the other works in commerce. They split the expenses of the household. She talked a lot about her tailoring and sewing business. She buys her fabric from Sandaga and makes boobas, scarves and shoes. She sometimes makes other items depending upon the demand. She is very content with her progress and mainly works in her neighborhood selling her products to her friends.Unfortunately, her funds are only enough to repay her loan because she doesn’t have much surplus. Once Madame Diop pays off this loan she hopes to take out another one and find a space for a small boutique. 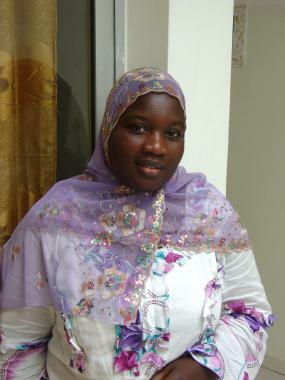 She hopes to display her clothing possibly at one of the large markets around Dakar for more exposure. Some of Madame Diop’s goods. Wanjira Ngure is a Zidisha borrower from Kianjoya, Kenya. Wanjira is married to a teacher, together they have one child, Gladys. Mrs. Ngure used to work for a HIV/AIDS group were she analyzed data. Since 2010, Wanjira has been running a small show near a shopping center. Mrs. Ngure used her Zidisha loan to purchase an irrigation system to help her grow produce on her family’s 2.5 acres of land to put up for sale at her shop. Mrs. Ngure recognized the need for fresh produce as a good business opportunity because most of the areas produce are shipped in from far away, and not usually fresh by the time of arrival! My name is Achintya Rai and I am Zidisha’s new Kenya Client Relationship Manager. This Sunday (5th Feb 2012), I went to the village of Kianjoya to visit Rahab Wanjira. Rahab’s husband James Ngure is a teacher in Mugaa Secondary School, where I am putting up. When I visited their home I met James in his work clothes, tending to his farm. He was the one who explained the business and its functioning to me. If I were to use one word to describe James, I’d call him no less than a ‘visionary’. There are certain people who have that spark that employment advertisements profess to look for. I feel very strongly that James has that spark of brilliance. The things he is doing with the resources he has at this remote location are remarkable. James has been working in the school for around 8 years. 4 years ago he decided to settle near here and bought this piece of land in Kianjoya. He did not know what else to do with the land so he and Rahab farmed it like everyone else to grow crops typical to here. Rahab also bought a shop in Mitimingi, which she used to take care of. They took their first Zidisha loan to stock this shop. A year ago, James and Rahab attended a seminar in Naivasha. That is where they got the idea of constructing a green house and using drip farming to irrigate the crops. A green house kit being sold at the seminar cost around 210,000 Kenyan Shillings. James investigated further after returning and was able to construct his first green house (15m x 8m) in around 50,000 shillings. They sold their shop in Mitimingi to arrange for this money. The returns from the first green house were so tremendous (James claims that a tomato crop inside the green house gives FIFTY TIMES more returns than a tomato crop the same size outside the green house) that they have now decided to gradually bring their whole farm under a green house. They used their second Zidisha loan to increase the acreage under greenhouse and to buy a drip irrigation kit. Now they have three green houses, all using drip irrigation and all made from local materials (polythene/plastic sheeting and local wood logs). James has dug two tanks in the farm to collect rainwater. He directs water flowing on the road into his farm to collect it into these tanks, which he uses to drip-irrigate his crops for the whole year. His future plans include lining his tanks with ‘dam liner’, which is a plastic sheet that prevents water from being absorbed by the soil. When one is in the presence of wisdom, one tends to test his own (perhaps not everyone, just men)- so I asked him that why didn’t he try keeping fish in his tanks to supplement his income. He nodded solemnly and said it was a good idea (I am sure he was smiling in his heart, but is too big a man to smile on my face). I also met Rahab and James’ little daughter Gladys, who didn’t smile at me till the very end, when I pulled her cheeks. Alex Kephar is a borrower living in Nairobi, Kenya. Alex runs a retail shop that sells groceries, and produce, to support his family. Alex initially sought a loan form Zidisha to buy more stock for his shop, and increase his profit margin. My name is Achintya Rai and I am Zidisha’s Kenya Client Relationship Intern. On 16th March I had the chance to visit Alex Kephar at his shop in Githunguri area of Nairobi. Alex has a general store in the main market area of Githunguri. Apart from items of general use, he also keeps fresh vegetables at his shop. He also has two piki-pikis (motorbikes), which he rents, and a donkey. It had just been a week since the disbursement of his loan when I met Alex so he had not yet utilized the full amount. Alex told me that he had divided the loan amount into three parts. One, he invested in buying charcoal, which he expects to rise in price as rains come. With the second part he had increased the stock of his shop and the last part he had saved to buy stock in the future. When I asked him if the loan had helped him, he very honestly replied that he hadn’t utilized the full amount yet so he couldn’t say with surety but he added that he expected to benefit much from the low interest Zidisha loan. Alex’s parents passed away when he was young and he depended on his uncles. He couldn’t complete his education because of this. He started working immediately after finishing school. Alex is determined to make sure his children (two daughters- Joyce and Grace) don’t lack opportunities and wants them to study further than him. Alex’s future plan is to own a wholesale business. He told me that he “hates supermarkets” and won’t have anything to do with them. He feels that supermarkets cater to the rich and they do not serve people who buy in small quantities. He feels it is these people, who buy more frequently but in small quantities, that make better customers. It’s the poor that Alex wants to serve. Talk about life choices that that are motivated by something above self-betterment. People like Alex are surprisingly abundant in Kenya. People who benefit from micro-loans and use their improved position to help others. I also met Alex’s wife Faith. Alex and Faith seemed obviously in love and after Faith’s many nudges to Alex (which seemed to say- “stop being a kid”), I was able to take a picture of both together.